We are pleased to announce that Dr. Robert Mitchell is the recipient of our first annual KEY Award for new faculty. 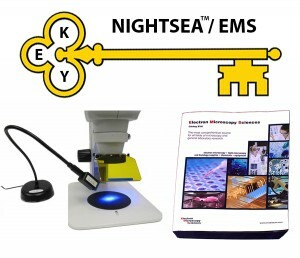 He will receive a NIGHTSEA Stereo Microscope Fluorescence Adapter outfitted with two excitation/emission combinations plus $750 in supplies selected from the Electron Microscopy Sciences catalog. Dr. Mitchell completed his post-doc with Dr. John Hildebrand at the University of Arizona (Department of Neuroscience) and is now in a tenure-track Assistant Professorship position in the Biology Department at the University of Wisconsin Oshkosh. His research concerns neural structures that respond to the most important odors in the life history of the insect, such as pheromones and host plant volatiles. Deciphering the function of these structures could fast-track the identification of odors that strongly influence insect behavior, yielding new methods to control and monitor for insect pests. He uses a combination of electrophysiology and fluorescent staining followed by confocal microscopy to assign function to these neural structures using beetles as the experimental model. There was strong competition for the award. We received numerous applications, all accompanied by strong letters of recommendation. All were worthy and our judging committee of established academic researchers had a tough job reaching consensus on a selection. We were very encouraged by the strong interest in the award and will be offering this again in 2016. Stay tuned for the announcement!